All rights reserved. No part of this publication may be reproduced, stored in a retrieval system, or transmitted in any form or by any means, electronic, mechanical, photocopying or otherwise, without the prior permission of the copyright owner. Applications for such permission, with a statement of the purpose and extent of the reproduction, should be addressed to the Director, Publications Division, Food and Agriculture Organization of the United Nations, Viale delle Terme di Caracalla, 00 100 Rome, Italy. Food production results from the interaction of human, animal, land, water and capital resources. In many farming systems of the developing countries animals have an integral role and the full range of animal products are utilized. Many of these outputs are also important farm inputs, such as, manure and draught power. Animals also provide a strategic source of cash which can be called on as required to purchase other essential farm inputs and food during the critical periods of the yea, thus helping to alleviate poverty and increase household food security. With an increasing world population, food production cannot be allowed to stagnate, clearly, there is a need for more sustainable increases in agricultural output. The complementarity between crops and livestock, which allows for nutrient recycling, energy and value added production is unique and needs fully exploiting. FAO has attached the highest priority to sustainable development of both plants and animal agriculture in its programmes. The Animal Production and Health Division (AGA) of FAO has instigated a number of case studies examining aspects of sustainability in the different agro-ecological zones and the major animal production systems in the world. This publication examines the role of animal production in the small farm systems in South-East Asia. Final editing and formating of the publication was undertaken by A.W. Speedy, Department of Plant Sciences, University of Oxford, England. 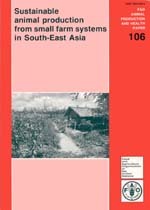 This introductory chapter provides the background to the importance of small farms in Asian agriculture, the generally low level of efficiency and the problems of resource degradation, competition for land for alternative enterprises, decreasing investment in livestock development by international agencies and inadequate demonstration of the role of animals in the development of sustainable agriculture. Human population increase and the overriding demand for food will be awesome and will increase pressure on the use of natural resources. A conceptual framework for the development of crop-animal systems is given. The chapter emphasizes the aim of the publication: to assess the opportunities for increasing the current contribution made by animals to improved efficiency in the management and use of natural resources, demonstration of low-input integrated farming systems, alleviation of rural poverty and sustainable production that has economic, ecological and sociological benefits. The focus of the publication is on South-East Asia, made up essentially of those countries in Indo-China and the Association of South-East Asian Nations (ASEAN): Brunei Darussalam, Cambodia, Indonesia, Laos, Malaysia, Myanmar, Philippines, Singapore, Thailand and Vietnam. South-East Asia presents an overwhelming panorama of small farms with large populations of small farmers and peasants who own both ruminants and non-ruminants. The small farm scenario, which includes small farm systems and small farmers, is described in detail. The key elements in a definition of small farms are subsistence, low income and illiteracy. Of the land area available of 434 million ha, only 17.8% is under arable and permanent crops, and 3.7% is permanent pasture. The ratio is about 0.96 ha/person. The average size of small farms is 1–2 ha. The density of ruminant livestock populations is highest in Asia, compared to Africa and Latin America. The evolutionary phases in integrated crop-animal systems is given. Three types of small farms are identified: farms in rain-fed agriculture, farms in irrigated agriculture and farms in plantation agriculture. Within these, two types of integrated systems exist: systems combining crops, non-ruminants, ponds and fish, and systems combining crops and ruminants. Eight major advantages of integrated systems are given. Characteristics of small farms (small size, crop-animal systems, low input use, low level of economic efficiency and diversification) and small farmers(low income, continual exposure to hunger and poverty, resistance to change, illiteracy and lack of interest in extension materials, but capacity to adapt and survive hardship, secure tenure and rational use of limited resources) are given. Gender issues are introduced, including the fact that women work longer than men and children are involved in livestock management. Animal populations in South-East Asia, as percentages of world populations, are approximately 13% of the buffaloes, 3% of the cattle, 3% of goats, 0.6% of sheep, 18% of ducks, 10% of poultry and 5% of the pigs. Approximately 76–95% of the different species populations are owned by small farmers. The number of small ruminants is increasing faster (3.6-4.1% per annum) than large ruminants. The highest growth rate was achieved by poultry at 9.1%. The average livestock share of agricultural and total GDP were 12.3 and 2.9% respectively. The significance of animal ownership is described. Several important indigenous breeds are identified and a classification of animal-based systems is given. Ruminant production systems are in three categories (extensive systems, systems combining arable cropping and systems integrated with tree cropping). It is suggested that the future nature of ruminants production systems is unlikely to change. However, shifts within the systems will occur through intensification. The contribution to food production includes meat, milk and eggs. Of the total meats produced, pig meat accounted for 44.3%, poultry meat 33.0%, beef and veal 11.9%, buffalo meat 5.5%, duck meat 2.9%, goat meat 1.6% and mutton and lamb 0.8%. The growth rates for total meat production, total milk and poultry eggs were 3.7%, 4.2% and 4.8% per annum respectively. Considerable variation exists in per capita dietary energy and protein intakes. The feed resource base is discussed with reference to forages, crop residues, agro-industrial by-products and non-conventional feeds. The total quantity of cereal straw and agro-industrial by-products from field and tree crops was 219 million tonnes in 1989, of which about 70 million tonnes or 32% are considered to be non-conventional. Constraints to feed utilization are discussed, including low digestibility, low protein content and toxic principles. Published information on nutritive value is available in all countries. The advantages of integrating ruminants with tree crops and the value of multi-purpose trees is described. The importance of strategic supplementation to create an efficient rumen ecosystem and balance the products of digestion with by-pass nutrients of dietary origin is emphasized. Priorities for feed resource use are indicated, including examples of primary feeds for intensive use in different countries. Major constraints to production are enumerated and discussed. These include size of farms, growth in illiteracy and urbanization, as well as institutional rigidity and too much emphasis on commodity-focused research. Attention is given to forage production, animal breeding, animal health, common property rights, support services, market outlets and manpower training. Individual constraints are discussed in detail and, in some cases, solutions are proposed. Thus, for example, constraints to organized animal breeding on small farms is considered with three alternative approaches: selection within indigenous breeds, importation of breeds for crossing and importation of improved breeds. Particular emphasis is given to the importance of the systems approach (stages, natural resources, participatory research and development, eco-regional relevance, inter-disciplinary research, monitoring and feedback). Experiences and lessons learnt about systems research in Asia are described. The latter include improved land use systems, gender effects, stability, sustainability, institutional support, farmer participation, shift from cropping systems to cropanimal systems and impact analysis. Potentially important sustainable technologies in South East Asia are identified and reviewed in detail. These involve both annual cropping systems and tree cropping systems. Within the former are food-feed intercropping, relay cropping, the three strata forage system, crop animal systems in lowland rain-fed areas, integrated animal-fish-crops systems and systems combining crops and animals. Practical benefits of supplementation, processing and all year round feeding systems are reviewed. Utilization of research results at the small farm level, phases in on-farm research and large scale on-farm testing are also discussed. The latter includes information needed by farmers and their advisers, mechanisms for the delivery of information to farmers and criteria for development orientation. Potential levels of productivity that can be achieved through the development of sustainable systems is illustrated. The development of integrated systems is discussed with reference to the pig-ducks-fish-vegetable sequence, integration involving various animals, significance of manure from animals, productivity of fish, and future of integrated systems involving ponds. The latter is limited by several factors such as inadequate land, feed availability and access to ponds. Integrated small ruminants-tree cropping systems remain to be fully developed together with an appropriate methodology. In the case of small ruminants, there are effects of animal integration on the parent crop as well as of the crop on the animal. Attention is drawn to the advances being made in integrated systems based on sugar cane. There is a general paucity of knowledge on integrated systems which justifies research and development to demonstrate their potential value. The framework for the development of integrated systems is addressed in detail. This includes criteria for project formulation, resource requirements, institutional requirements, policy support, implementation, criteria for evaluation and impact analysis. The conservation of on-farm genetic bio-diversity is accorded a high priority. Several criteria for project formulation are listed (e.g., national and regional development goals and requirements for the alleviation of poverty and sustainability of the system). Criteria for evaluation include cost-benefit analysis, before-and-after trends and environmental accounting. Impact analysis involves the direct effects on households and indirect benefits of the research. The concluding chapter reiterates the continuing importance of small farm systems combining crops and animals in South-East Asia. The challenging task is that of linking sustainability to agricultural growth and the alleviation of poverty. For animal production, the challenges and expectations will be even greater, in view of concerns about their current contribution. An increased contribution from animals in the future needs to be identified with their ecological and socio-economic impact. The development of sustainable integrated small farm systems using a systems approach will require more intensive and complex methodologies, greater farmer participation, awareness of increased environmental concerns and continuous monitoring of the sustainability of the systems.